The last evening in Cusco, where to go to eat? 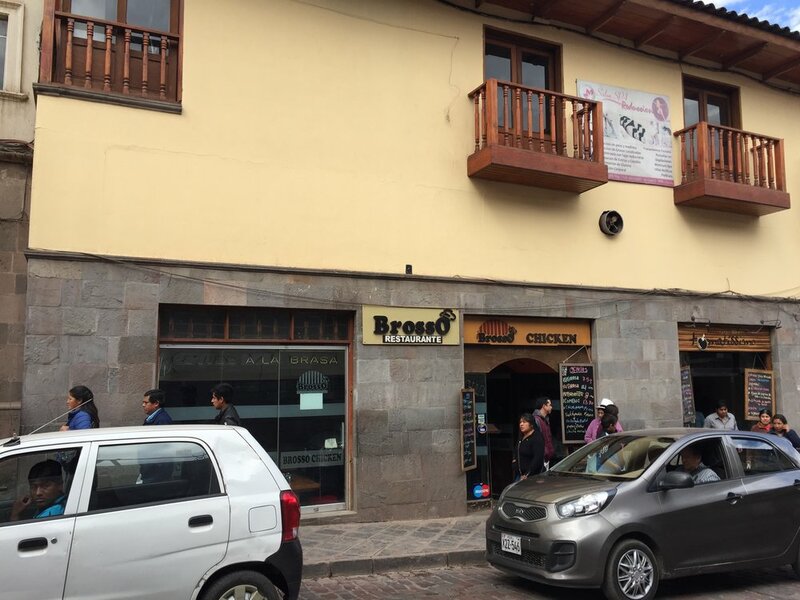 Well, after a full day of touring, and coming back to a cold Cusco, my sister and I came across a hole-in-the-wall eatery along Concevidayoc, while walking to our hotel from a supermarket, serving caldo de gallina, or chicken soup. It really was a hole-in-the-wall! Just a space as big as the opening in the wall, with some plastic chairs arrayed around some eating pushed up against the wall. It was staffed by this friendly lady, and a couple of her friends, manning a large cauldron of chicken soup. A simple dinner that came to the table instantly, it consisted of noodles and carrots in broth, a hard boiled egg, and some chicken. You could garnish it to your taste with scallions, lime, and ají peppers. It was just right for this chilly evening when we were tired and wanted to stay close to the hotel. In fact, this was just across the street from our rooms at the Tierra Viva Cusco Centro! The next day, on the way back to the hotel to pick up our bags and head to the airport, I made a little detour to have Peruvian roast chicken, pollo a la brasa, in Peru! 20 minutes would be enough to have lunch right? TripAdvisor and Lonely Planet recommend Los Toldos Chicken at the corner of Almagro and San Andrés. Walking by, it seemed a bit empty, with just tourists inside. But just just a couple doors down from it along San Andrés was Brosso, which seemed hopping with locals (as far as I could tell, of course!). It looks like fast food, but they also have a waiter taking orders. We headed upstairs to a table, but our friendly waiter made sure that we knew about the salad bar downstairs. You can spot it on the left in the photo below, right beside the stairs. And the chicken itself - so juicy and flavorful! I don't know what makes it Peruvian, but it sure was delicious. It was served with a generous helping of fresh, crisp french fries. You can help yourself to the salad, but I guess given the self-serve nature they only provide you with tiny, tiny plates. Still, it was welcome to have some fresh vegetables along with the chicken and fries. It was a rush to finish and speed walk back to the hotel, but so worth it for a final taste of Peru!